Diane apologise to Chas for bringing Gordon back into her life. Robert tries to convince Aaron everybody knowing is a good thing. Aaron's convinced his step-mother Sandra is his only hope, but he can't find her. Robert makes a mysterious phone call and asks the person on the other end to do him a favour. Chas apologises for the previous day and Aaron's stunned when Robert soon says he's found Sandra, she's changed her surname. Laurel wonders where Gabby got the pricey bridal magazine from and doesn’t believe her when she says Jacob gave it to her. Ashley despairs Gabby has turned into a prima donna since moving into Home Farm and is determined to tackle it head on. They go to see Bernice who suggests Gabby's been through a lot recently, hoping Ashley has no more surprises in store, leaving him and Laurel uneasy about the pregnancy news. Chrissie hears Lawrence is looking for a new assistant groundskeeper and forms a plot. Chrissie offers Andy the job. But will Lawrence agree? 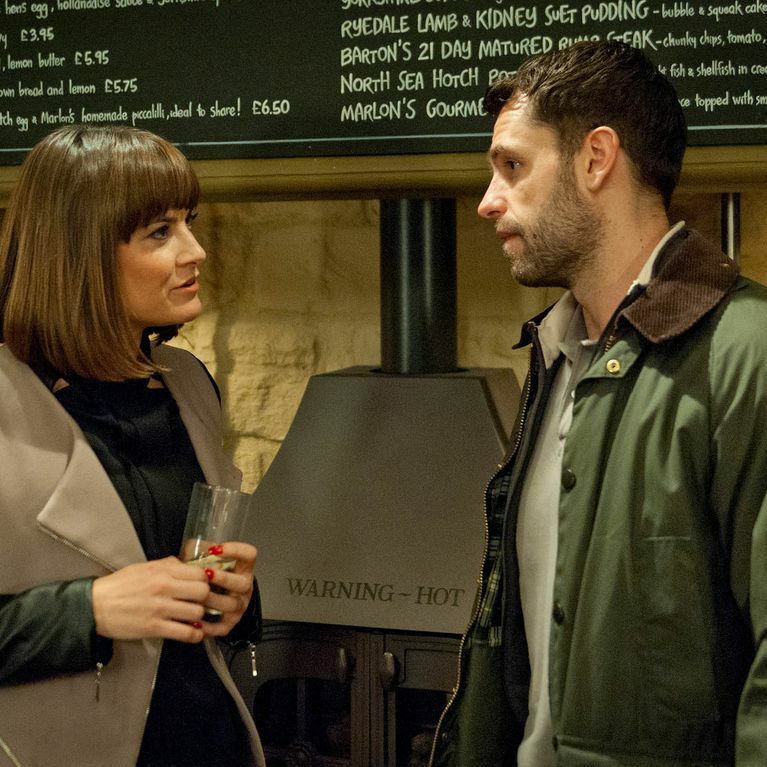 Rhona tells Paddy that she's ready to talk and wants him to start from the beginning. But soon, Rhona's left feeling sick after learning the truth about Paddy's double life and is mortified when she loses her temper in front of Leo. Rhona explains she wants them to carry on as normal but Paddy's left unsure how it will work. Robert forces Aaron to take him with him when he visits Sandra and Aaron is pleased to have the support. Aaron decides against telling Chas and lies about a job instead. Cain can see Chas is starting to unravel and is shocked when she lashes out at him. Meanwhile Aaron and Robert pull up outside Sandra's house, wondering what to do next. Aaron's unsure if he can face her. Robert suggests they go for a drink first. Meanwhile in the village, Cain opens up to Chas. Robert and Aaron have a serious chat together but are interrupted by a teenage girl wanting a bus fare home. Later near the house, the same girl, snatches Aaron's wallet and Robert tackles her for it. When they get to Sandra's house they see the same girl and Aaron realises it is his sister, Liv. Chrissie is keen to get her plan in action. Chrissie and Lachlan set up webcams to catch Bernice cheating. Later, Chrissie asks for Andy's help with a job, glad to finally have the bait for her trap. Andy's thrown when Bernice fills him in on why he’s been hired. On a date, Jacob is horrified when Gabby tells him about the break in at the barn. Rakesh gets a call from Charity who wants him to get all her money out of Home James. Marlon offers to do the catering for Laurel's wedding but will he regret it? Emmerdale 5/2 - Will Aaron finally go to the police?